In the course of digging into various tiaras and various royal traditions, a series of requests has arisen in the comments and in my email for actual definitions of some of the common jewel terms I throw around. What constitutes a tiara, and how is that different from a diadem, or a crown? You get the picture. Probably should have taken care of that first thing, but hey, better late than never. 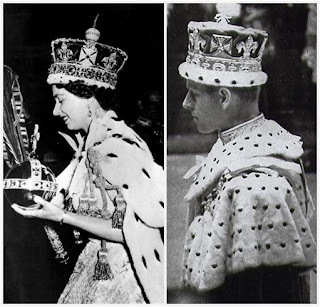 Crown: I suppose, technically, crown could function as a generic word for any sort of ornamental headdress; but you usually see this word referring to a headpiece with a greater significance and place in the rites of monarchy. We'll define a crown as a circular headdress, typically with arches, belonging to a sovereign. Coronet: A coronet is like a baby crown, I'd say. It also belongs to the rites of monarchy (coronations, for example). Coronets are also circular like a crown, but usually without arches, and their form often signals a noble rank. Diadem: Oh, this one is tricky. Diadem often refers to the ancient markers of status that led to today's crowns and tiaras, and you'll also see it referring to a tiara or crown with perhaps a little more gravitas than the average headdress. 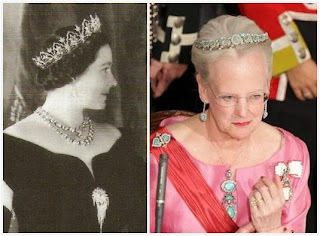 On this blog, I sometimes use diadem interchangeably with tiara, for really no other reason than it is awfully boring to read the word tiara fifty times in a single entry. 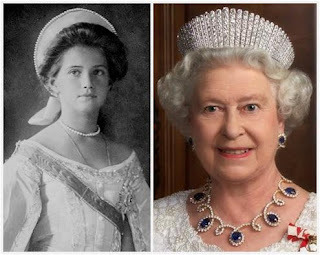 Most readers of this blog hail from English-speaking countries, but it's worth noting here that tiara translates to something spelled somewhat like diadem in several other languages, which will affect the overall understanding of this word's definition. Tiara: Technical attempts to define tiara usually end up referring to a semi-circular bejeweled ornament worn at the front of the head by a lady on a formal occasion (the Papal Tiara being a notable exception). I personally define tiara as any kind of non-crown headpiece that still encircles a good portion of the head. There are several other terms that fall under here as different types of tiaras as well. Circlet: A tiara that goes all the way around (or nearly all the way around) the head. Can also be used in reference to something that might be classified as a crown or a coronet. Bandeau: Sometimes people ask where the border falls between a tiara and a bejeweled headband; if you're asking that question, you're probably looking at something that falls in the bandeau category. Bandeau refers to a headband style tiara, often rather low in height and without as much height variation along its top profile. Kokoshnik: This is actually a sort of headdress from Russia's national costumes. Adapted and gem-covered at the Russian imperial court long ago (at left is Tsar Nicholas II's daughter Maria in court dress), when we use kokoshnik to refer to a tiara today, we're talking about something bejeweled that maintains the shape and/or style of those traditional kokoshniks (the most famous example today being Queen Alexandra's Kokoshnik Tiara worn by Queen Elizabeth at right). Aigrette: Originally an ornament which can either hold a spray of feathers in the hair or on a hat, or just depicts a feather motif, the word is derived from the egret bird whose feathers were often used with these pieces. This sort of ornamentation was popular up until the early part of the 20th century; nowadays, remaining aigrettes are used without their feathers, and the term can sometimes be used to refer to other sorts of flexible ornaments for the hair (Queen Margrethe has a Floral Aigrette Tiara, for example). Aigrettes are usually too small to fall under the tiara definition for me. Parure: This one doesn't actually refer directly to any sort of head ornament, but instead refers to groupings of jewelry which might include a tiara. A parure is a set of different pieces of jewelry which were designed to be worn together. A full parure might include a tiara, a necklace, a set of earrings, a brooch, and a bracelet, for example. There are also different terms for less-than-full parures; a demi-parure would have two or so pieces of jewelry to it. Using parure in the name of a tiara, as I sometimes do, is really just another way to make the name unique from other tiaras out there for ease of identification by referring to the complete set it belongs to. Do you have any other words to add to our glittering glossary, or any alternate definitions to share?